Posted: Fri 11 Dec, 2015 10:04 am Post subject: Danish Oakeshott Type XVIIIe swords (& other 2-handers). "Et ny fundet gravsværd fra Øm kloster med et katalog over middelalderlige gravsværd fra det nuværende Danmark." I can now give pictures and measurements of some of the Danish XVIIIe swords found a Danish graves and will try to put pictures and sword information together. From Ada Bruhn-Hoffmeyer's book you first have this picture. Pommel: 5,5 cm, pear-shaped and facetted. Grip: Wood with probable traces of leather and iron bands. Unidentified mark in the ricasso. Kalundborg museum inventory number: 6605. 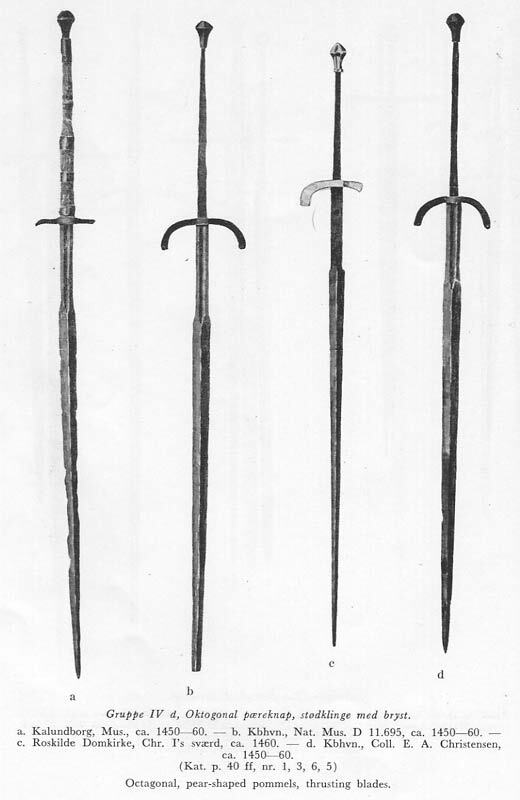 The second sword (left to right) is from Nationalmuseet with the inventory number D 11695 (11.695 is a typo). It is a find from Sorø Sø on Sjælland. Cross-guard: Flat and strongly curving forwards [no measurement given]. -> So total length should be 136,5 cm + whatever size the pommel can add? Pommel: 7 cm high, pear-shaped and facetted. Grip: 34 cm. Wood and iron threaded bands (another study says 5 bands with brass thread). Blade length: 98 cm (rhombic blade geometry). Nationalmuseet inventory number D 1575/1961. Grip: 32,5 cm, wood preserved and iron thread binding. Cross-guard: 22 cm slightly curved forwards, tip of one end broken. Minuscle (?) mark on the ricasso. NB: This sword shows a folded tip on the picture, so interestingly it could be a practice sword? Pommel. 5,5 cm high, pear-shaped and facetted. Grip: 33 cm, wood and iron thread binding. Cross-guard; 17cm, "båndformet", curved forwards, tip of one end broken. Nationalmuseeet inventory number D 1423/1957. Pommel: Pear shaped and facetted. Blade width: Max 4,5 cm. Width of Tang: 2,2 cm. Crosss-guard: Only a little fragment left. On the Ricasso is seen a shield?-shaped stamp. Lastly from Søborg Lake or Søborg Castle Vilhelm Boye reported a long-gripped two-handed sword in 1882, which perhaps not is a Type XVIIIe as it's unclear from the picture if it has an extended ricasso. Fund af Gjenstande fra Oldtiden og Middelalderen i og ved Søborg Sø. So besides this picture (see attachment) I don't have anything else to go on. The following was excavated in 1924 near Mook, in Limburg, Belgium. The sword is too small to be a true two-hander like the others, being only 117 cm long, with a 941 cm blade. The hilt is thought to have been shortened however. The curved cross is a modern restoration, modeled on a sword of near identical proportions in a private collection. The sword was held by the Legermuseum in Delft, and has presumably now passed to the new Militair Museum. Here are two additional plates from Hoffmeyer showing a few more XVIIIe's and other long-gripped swords held in Copenhagen. D8804 in plate XXV.e might be the Soborg sword you posted. So its inventory number for Nationalmuseet is D 8804. It really doesn't look like it has a ricasso (and if it has it is not narrowed), so a different type of sword blade comapred to the "typical" Danish XVIIIe, but does have the same kind of long grip with iron bands, forwarded type of cross-guard and pommel. I have probably located another of this type (without narrowed ricasso) from Odense - Sct. Hans Kirke (see attachment), which is not shown in Bruhn-Hoffmeyer's book. (It looks even more like the d)-sword on the first plate you showed in the above thread, that also has a fuller, but in the Odense sword the fuller is even longer). Cross-guard: Flat, curving forwards (no length given). A mark in yellow metal is inlaid 5 cm "under" the cross-guard (unclear if "in front off" or "behind" the cross-guard). Sword from a grave in Sct. Hans Church in Odense. 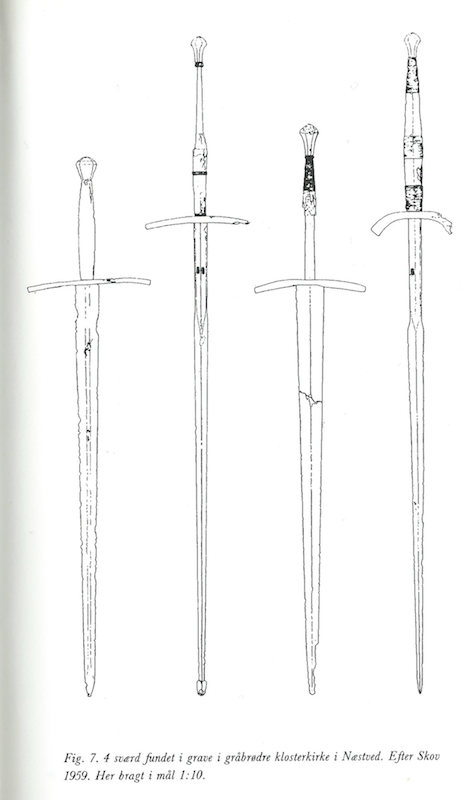 Source: Danmarks Kirker, page 1418.
a different type of sword blade comapred to the "typical" Danish XVIIIe, but does have the same kind of long grip with iron bands, forwarded type of cross-guard and pommel. There is definitely a good amount of variety in the blade types of these long-hilted Scandinavian swords, but they seem almost uniform in having type T pommels and curved guards... maybe another indication of imported blades being hilted locally according to regional preferences. Thanks Niels and Mark, I just love these long-hilted Scandinavian two-handers. I think the Soborg sword may be the one in the centre of the attached photos, taken in the National Museum, Copenhagen. Trying again to attach photos. I think blade-smiths would sell bare blades and then both pommel and cross-guard would be added later locally. Just with the amount of Type XVIIIe in Scandinavia compared with elsewhere I wonder where the blades were produced? Did smiths receive bare blades and then reworked them and creating the ricasso explaining why it's so prominent in Scandinavia? The uniform pommel type could be based on a specific fighting style, where you grip the pommel firmly to add thrusting power. Cross-guards actually varies in the Danish examples - some are straight and only very slightly curved forwards; while others are very prominently curved creating a "U"-shape. Neil, thanks for the images - the one discussed must definitely be the Søborg Lake sword. (Shame you can't see the inventory numbers of the swords on the picture - but maybe they are not even display in the collection). It is really massive in length - perhaps 150 cm? I think the Soborg sword may be the one in the centre of the attached photos, taken in the National Museum, Copenhagen. This sword is from Slesvig and must be a find before 1864, when Slesvig was still Danish. This type of exact cross-guard is found on a grave-sword from "Øm Kloster", which doesn't have a narrowed ricasso though. Sadly Nymark (1980) only mention the Slesvig sword in passing and doesn't add it to her catalog as it is not a grave-sword. But she mentions that the cross-guard of the Slesvig sword is shorter than the Øm sword - (Øm sword cross-guard given as 27 cm in her catalog). So the D 1496 is perhaps an example of a sword with narrowed ricasso from (originally) Denmark, that is not a 2-hander but a hand-and-a-half sword like the sword mark showed from Mook in Belgium (just the Belgian had the U-shaped cross-guard). It does have a shorter grip than the other swords shown with "narrowed ricasso". NB: The sword just left of the pretzel-sword from Tude Å added by Neil seems to be a third sword of that type. It is very like the Øm Sword, but has a different pommel, and while the pommel is identical to the Slesvig-sword (D 1496) it doesn't have a narrowed ricasso and has a very long grip while the D 1496 has a "fairly" short one. The c) sword on this plate I'm sure you recognize as the Ordrup Mose Sword. Nymark (1980) gives a little info about the two swords a) + b) on this plate. She says they have around the same dimensions of the Øm sword (so probably ~115-120 cm in length). They are in "Nationalmuseet" without inventory number - so likely collected very early and with unknown find-spot. the one discussed must definitely be the Søborg Lake sword. It is really massive in length - perhaps 150 cm? Measurements are from "Beiträge zur geschichte der schwertmarkierung" by Schmid et al, in Zeitschrift für Historische Waffenkunde, vol. VIII (1920). Fantastisch Zeitschrift Mark. (It is pictured on page 151 and with measurement (6a) on page 154). (Its in a great article on sword inscriptions )! It must be a correct identification! The Skt. Hans sword was first found in 1922 and it is shorter (133 cm). If the D4850 is 151 cm, it makes it the longest Danish sword so far! The Søborg Lake sword could perhaps be even longer! Additional two-handers are shown in Hoffmeyer, plate XXXVIII. The second sword is likely D 1496 where the cross-guard has slipped down, so it looks like it has a much longer grip. The last sword you mention D4446 is one of the Hinge Sø swords - it still has some of the wooden grip preserved and has a "C-guard" and I have posted a good illustration of the D 4445 sword on the "pretzel" forum and a close-up of the D 4446 sword's hilt. So the b)-sword on Bruhn-Hoffmeyers Plate XXXV is of unknown origin and find-spot. The D 11.695 sword is probably a typo in Bruhn-Hoffmeyer's book - should be D 11695 (?). Yes the sword shown by Worsaae (1859) is definitely D 9106 in the center (illustration number 579 in the book). Besides the D 1496 you have at least one other Danish sword with upturned cross-guard ends. This is a sword found in 1977 in a grave near Øm Kloster and described in Nymark (1980). In the grave was found the remains of a man between the age of 40-60 years. His height was 184 cm (!) and his death was of unknown circumstances. In the grave some traces (rust and wood) was found of a scabbard; also an iron buckle and a ring-locket of bronze with traces of textile were found. On the blade on both sides were brass inlaid marks 9 cm under the grip (partly preserved), which looks a bit like marks from Solingen or Passau, though no definite identification with existing known marks could be done. Grip: 27,5 cm - wood fragments preserved. Cross-guard: 27 cm, narrow curving forwards with upturned ends. Blade width: Max 4,7 cm ("lens-formed" blade geometry, but "flat" on the first quarter of the blade). Is deposited at Øm Kloster Museum. Source: Nymark (1980), page 122. I borrowed Hoffmeyer's book from the library some years ago and noted some of her measurements ( from a different page than the plates). I have noted that the Soborg sword (D8804), plate XXXVe is 162cm total and 114cm blade. The Helsingor sword (D4850), XXXVd is 152cm and 105cm. But I have noticed that Hoffmeyer, like Oakeshott, could be careless or mistaken in her measurements so I cannot guarantee these figures. Even if she is off by some cm's, ~160 cm seems right from the size of the Søborg Lake sword compared to the others surrounding it on the picture from Nationalmuseet. I quite like this type of cross, very graceful looking. There is another example supposedly in the Nationalmuseet shown in the Schmid article, but I don't see the inventory number given, and it doesn't seem to appear in Hoffmeyer. It appears to have very similar proportions to the Øm Kloster example, but just a bit larger in all dimensions. Updated the previous post to reflect the best information collected. Thanks Neil. I was recently able to scan all the illustrations, but did not have time to make scans or take notes on the text.